Mr Therm Boilers for Life is a new company set up to offer boilers at an affordable price without any hassle, giving you peace of mind for your heating. The business has been trading since 1994 as Mr Therm Ltd, a reputable supplier & installer of domestic gas appliances, offering a complete range of services to both domestic & commercial clients. 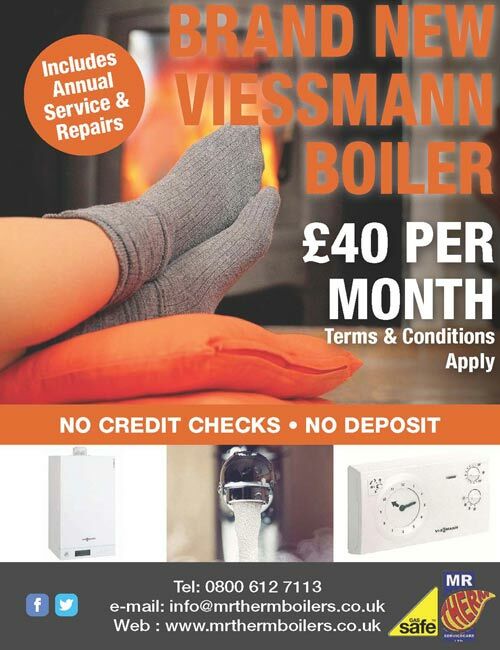 As a registered Viessmann installer the new business can offer customers a terrific deal where they only pay from £40 per month for a new Viessman Vitodens 050-W series boiler and have no worries for 10 years. We fully service your boiler every year and will repair it with no extra charges throughout this time. There are no hidden costs –no down payments – no balloon payments - no finance charges as we fund the boilers ourselves. With efficiency levels of over 95%, our boilers help to keep your carbon footprint low and save money on energy & fuel costs. We make sure you’re comfortable in your own home. Our 24-hour emergency boiler repair means if your boiler breaks down, we’ll be out in a flash. Finally, all our work is guaranteed, and all our gas engineers are Gas Safe Registered, so you won’t be left with a poor-quality job. Get in touch now for a free quote and survey. Oh … and the first 30 to sign up for a new boiler will receive £100 of Love-to-Shop vouchers and if you recommend a friend and they install a boiler from us, you will receive £100 of Love -to-Shop vouchers! Are you a Property owner? Do you want peace of mind as well, knowing the boiler in your property will be well cared for over 10 years … this could be a deal for you and keep your tenants happy?